Once I publish a quiz, how can I give my students extra attempts? You can grant access to an individual student, several students, or the entire class to have extra attempts on a quiz. 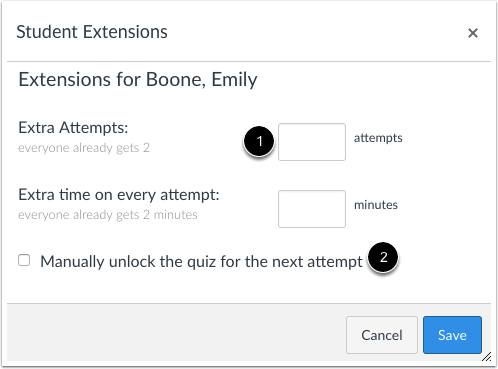 If your quiz is locked, you can also manually unlock the quiz for a student, even if the student has not yet taken the quiz. You can add extra attempts through accessing student quiz results or moderating the quiz. Accessing Student Quiz Results is a quick way to allow an extra attempt for an individual student. 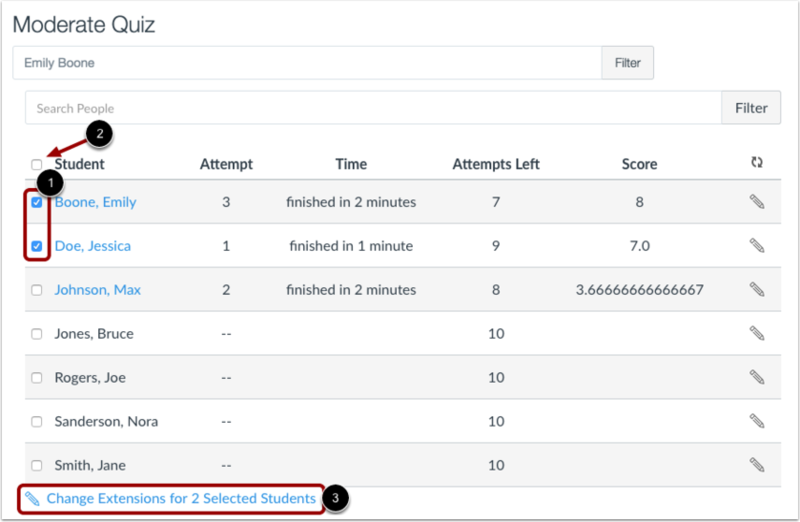 Moderating the quiz lets you allow extra attempts for individual students as well as multiple students at once. This option also allows you to grant extra attempts for students who have not yet taken the quiz. For timed quizzes, you can grant extra time for an attempt. If your quiz options allow students to view results only once after each attempt, you can also let students view quiz results one more time. You can also use these options to remove attempts as well. For instance, if you need to remove a student attempt, you can decrease the attempts accordingly. Note: When extra attempts are given via the Moderate Quiz option, Canvas keeps the highest quiz score by default. You can edit quiz scoring options to keep either the highest score, the most recent score, or an average of all scores. Click the name of the quiz. To add an extra attempt for an individual student, click the Options icon , then select the Show Student Quiz Results link . Under the heading Students who have taken the quiz, click the name of the student. Note: To give an extra attempt to students who have not taken the quiz, you need to add an attempt by moderating the quiz. Click the allow this student an extra attempt button. The student will automatically receive an extra attempt for the quiz. To add attempts for one or more students, click the Moderate This Quiz link. To moderate a quiz for one student, locate the student and click the Edit icon . You can also filter students in your course by using the Search People field . Type the number of extra attempts you'd like to give to the student in the Extra Attempts field . 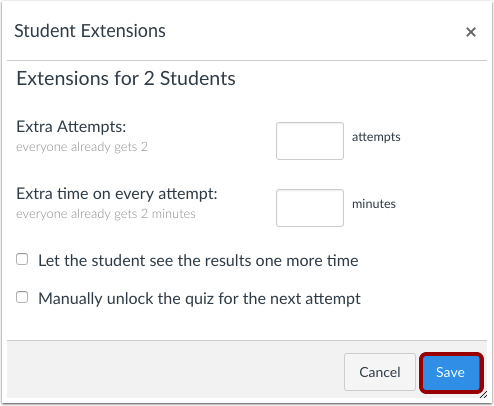 If your quiz is locked because of accessibility dates, you will need to unlock the quiz for the student by clicking the manually unlock the quiz for the next attempt checkbox . Note: If a quiz requires an access code, students will still need to enter that code to begin their quiz attempt after it has been manually unlocked. Depending on your quiz settings, the student extension box may contain additional options. If the quiz has a time limit and you want to give more time, type the number of extra minutes in the Extra Time on Every Attempt field . If the student hasn't taken the quiz, the extra time will be added to the student's initial attempt and additional attempts. Learn more about managing extra time in timed quizzes. If the quiz is saved with the Only Once After Each Attempt option, you can let the student see the quiz results one more time . Results include both their responses and the correct answers. Once the student has viewed the quiz results, the results view extension will be reset and the results will be hidden again. Learn more about limiting quiz results. Note: If the Only Once option is selected and students have also been granted an extra attempt on the quiz, students will be able to view the results before they take the quiz, as well as after they complete the quiz. 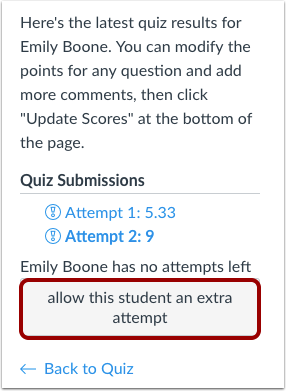 If students are allowed multiple attempts on a quiz, you may want to edit the quiz and select the Allow Multiple Attempts option, which gives an option to let students see their quiz responses only after the last attempt. If you want to select multiple students, click the checkbox  next to each of their names. If you want to select all students, click the top checkbox . Click Change Extensions for [#] Selected Students button . 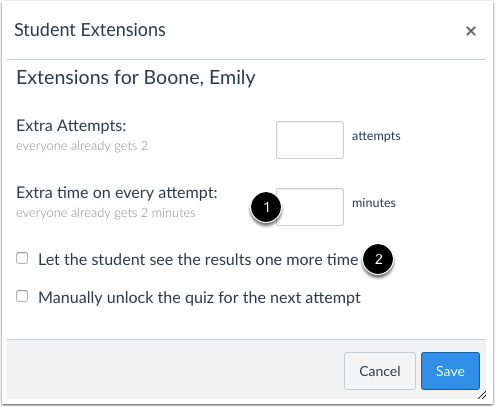 Complete the extensions for the students you selected. 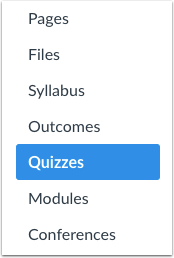 Remember, depending on your quiz settings, additional quiz options may display for all selected students. Previous Topic:Once I publish a quiz, what kinds of quiz statistics are available? Next Topic:Once I publish a timed quiz, how can I give my students extra time? Table of Contents > Quizzes > Once I publish a quiz, how can I give my students extra attempts? Re: How do I grant special access to quizzes for specific students? Re: As the course instructor, how do I delete a student's initial, original quiz attempt and then re-post (or reset) the quiz for that student, while keeping it active during the same parameters originally established? Re: Can I reset the midterm exam for a student?